Drowsy Driving vs. Drunk Driving vs. High Driving | Advanced Sleep Medicine Services, Inc.
It’s well known that there’s a correlation between sleeping patterns and marijuana usage. Research shows that there are some strains that work better at inducing sleepiness or lowering pain and stress symptoms. This alone makes marijuana an appealing alternative or last resort when nothing else works. Those who are turning towards marijuana to cure insomnia, though, should be aware of the problems associated with consuming it as it can certainly be tempting to use it for purposes other than as a sleeping aid. One common problem, for instance, is that people are now smoking marijuana and getting behind the wheel. Some may think that one puff won’t affect them enough to fall asleep while driving, but the problem goes beyond that. There’s a bigger picture to consider. 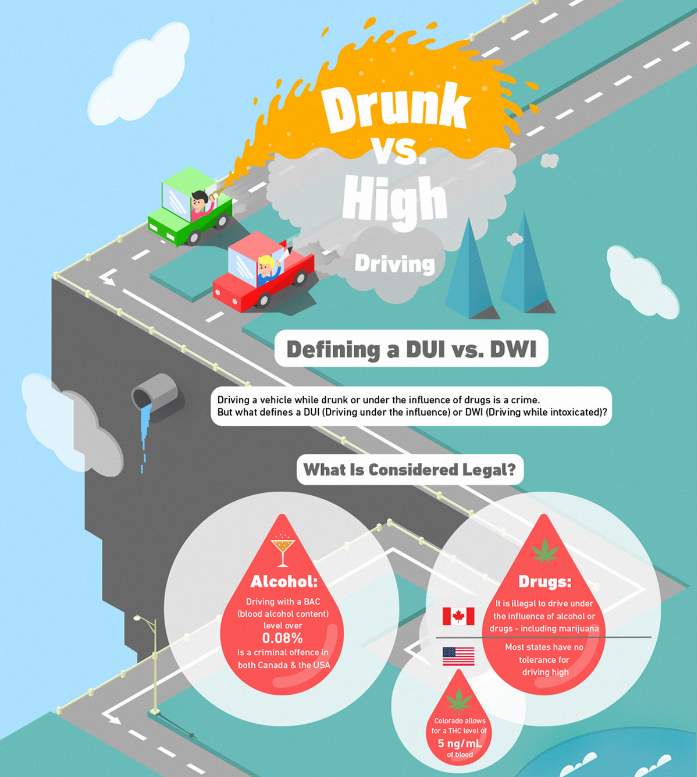 The facts about driving drowsy versus driving drunk are well known, but what about driving drunk versus driving high? Impaired driving is the most common cause of fatal car crashes in both Canada and the USA. Driving under the influence of alcohol can be easily determined and regulated, but when it comes to driving under the influence of marijuana, we have a problem! Drinking and driving is illegal in both Canada and the USA. Actually, driving with a blood alcohol content (BAC) over 0.08% is a criminal offense in both countries. It is strictly regulated by the laws and measured by a breathalyzer test with extreme accuracy. Still, one-third of all car accidents in both countries end up being fatal. Over a million of Americans are arrested for driving under the influence (DUI) of alcohol. The statistics are alarming! Also, it is really important to emphasize that driving under the influence of drugs, including marijuana is illegal, and most states do not tolerate it (except a few). Seven out of ten Canadians are looking forward to next spring with excitement because they support marijuana legalization. Ever since Prime Minister Justin Trudeau announced the beginning of the complex process, government agencies have begun their work on marijuana laws and regulations. However, a lot of aspects need to be strictly regulated, like possessing, selling, producing, and driving under the influence of marijuana. That’s why law enforcement agencies should prepare drug-impaired laws before marijuana is legalized in Canada before it’s too late. What can Canada learn from Colorado? Five US states have legalized marijuana by now (Colorado, Washington, Washington DC, Oregon, and Alaska). But, back in 2014, when Colorado legalized marijuana for recreational use, the state was not prepared to deal with smoking and driving. And over time, the state was facing the real problem and had to regulate marijuana-impaired driving. Today, Colorado allows less than five nanograms per milliliter of blood of THC when driving. Also, there are punishments for not following the rules. However, detecting drivers under the influence of marijuana remains one of the biggest challenges for Colorado police. While police can conduct field sobriety tests by using a breathalyzer test if they suspect a driver is impaired by alcohol, there is no reliable established method to easily detect and measure impairment when it comes to driving while high. The accuracy and effectiveness of a few pilot methods and saliva tests are being assessed before they become police routine. But until then, police officers are trained to recognize marijuana-impaired drivers by their behavior and physical appearance. When can you be charged with DUI? What are the consequences? What are the penalties for impaired driving? This infographic from OMQ law firm based in Toronto gives a nice comparison of laws in Canada and the USA. So, let’s take a close look at what can Canada learn from five US states where Marijuana is now legal. If you or a loved one is suffering from excessive daytime sleepiness due to a suspected sleep disorder, talk to your doctor right away. For more information about scheduling a sleep study, contact us. Pot: An Alternative Treatment for Sleep Apnea? Hanna Anderson is a legal assistant who works at O’Neill Moon Quedado law firm in Toronto. After working hours, she likes to spend her free time by reading, traveling and doing yoga. Thank you for that info graphic! It is well done. Back in December I wrote an article titled “​4 Steps to Save a Life This Holiday Season” which can be found on my website and talks about what to do when you see someone drunk driving. Since then I’ve been reading articles on how drowsy driving or driving high are equally as dangerous. But what your article brings up, that I had never thought about and haven’t read about yet was how there is currently no way in place to uniformly tests for these impairments. That is an important piece in the puzzle that I hadn’t thought of. Thank you for bringing that up! Hi Betty. Yes, there’s a lot of awareness about the dangers of drunk driving, but not enough about drowsy driving.